Here's an update on my Squirt project. 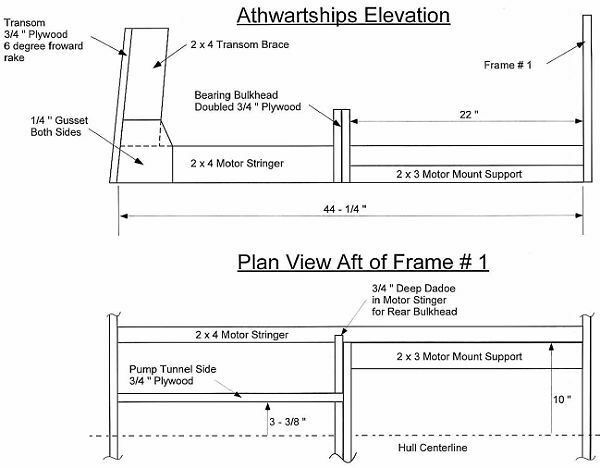 I've also attached a drawing I made for the structural changes that I will need to make for the jet drive installation. If you think it's appropriate, feel free to post this in the "customer photos" section. If you have any comments on the structure I'd sure like to hear about them. Note that I've eliminated the keel and inboard battens aft of frame number 1 - this allows me to mount the jet drive an inch lower in the boat than I could otherwise. Also, I was thinking about using 3/8" plywood for the aft bottom section, and installing both sides in one piece aft of Frame #1. I plan to block all the corners (i.e. no screws into end grain) buy have chosen not to do that for simplicity in the drawing. March 1 - I haven't done much woodworking in the last couple of months, but a lot of design engineering! Turns out putting a jet drive in a Squirt is a fairly complex proposition. In December, I cut out and assembled the stem, breasthook, and both frames. The transom is cut out but not assembled due to uncertainties in what needed to be done for the jet drive modifications. I found and purchased a well-worn but good running jet ski (a 1982 550 Kawasaki) off e-Bay. Then I completely disassembled the jet ski to get all the "good stuff" out, and measured all the critical dimensions. I also purchased the service manual for the ski from Kawasaki. 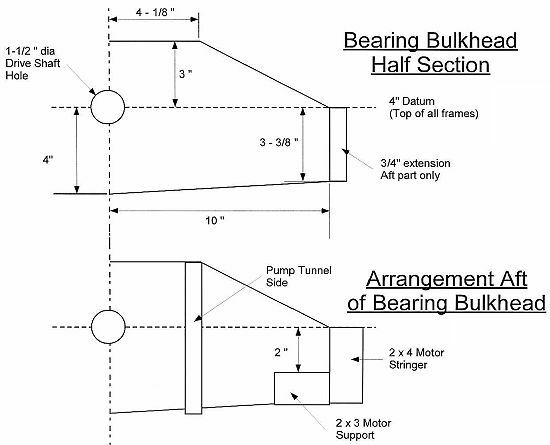 This gave me a wealth of good information - including things like the jet pump thrust (340 lb) that I needed for the boat structural modifications. Unfortunately, the manual didn't provide things like bolting patterns, these I traced onto heavy paper, then transferred them to 1/4 plywood to act as templates. Just to make sure, I've decided to do a "prototype" of the arrangement, just to make sure everything fits properly before I actually do the frame assembly. I'll report how things go with the prototype next month.